I know that this is going to sound strange, but one of the first things that struck me about older properties in Yorkshire was the wooden gutters, particularly on out buildings. I hadn’t seen these before and had assumed that the guttering was made up using standard pieces of timber – it all looked very hand-made. Now we have our own outbuildings, we have our own wooden guttering too! I don’t know why, but it never occurred to me to look at it more closely until now. This is mainly because I am not that convinced by the plastic guttering that we have put on the re-roofed outbuilding. Maybe, it will be more temporary than I expected! Still, it will keep the rain away from the base of the wall, but it doesn’t add much to the look of the property. 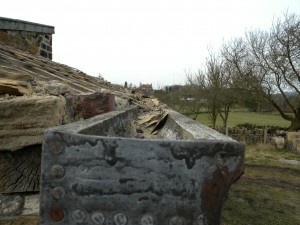 The existing wooden guttering is made from a single piece of timber that has had the water channel machined out. 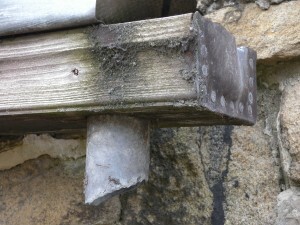 A hole is then cut into the base of the gutter for the down pipe, this is achieved using a lead “top hat” – think of a top hat upside down where the water flows out of the top (or rather bottom) of the hat. This “top hat” is inserted through a hole in the gutter and into the top of a drain pipe (made of a material of your choice). Bizarrely, I saw the lead top hats in the builders merchants last week and thought “oh, they look like the inserts for the wooden gutter, I wonder what they are really used for!” It would appear that they really are for wooden gutters after all. A quick investigation online would appear to show that there are a number of local suppliers of both wooden gutters and lead top hats. More investigation needed. 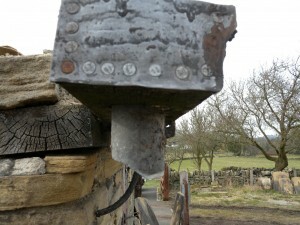 Both the “top hat” and the end plate are made from lead. I have no idea how long these have been up, but I would guess at 50 plus years. Apparently, the wood lasts longer if you do not paint it – this lets the wood breathe and does not trap the moisture inside the wood. The end plate is cut out of lead and nailed on. The “top hat” is also made of lead and drops into a hole that has been cut in the bottom of the gutter. The bottom of the top hat is then dropped into a downpipe. A view along the top of the gutter. The water channel has been machined into a solid piece of timber. The end plate is made of lead and nailed on. Read with interest about your wooden gutters. Have you come across wooden downpipes? Looked at a house in Yorkshire today and that had both. Never seen their like before.